Content Assessment Audit | Jody Nimetz Co. | Jody Nimetz Co.
Jody Nimetz Co. provides content audits with our Content Assessment Audits for small, medium and Enterprise level businesses. Wondering how well (or not) that your content is performing in Google and search engines? Our Content Audits focus on SEO and how well your content is performing specifically in Organic Search. I have been conducting site audits since 2002. I have performed Content Audits and developed Content Strategies for some of the largest brands in the world and have helped shaped their digital marketing strategies based on findings from their Content Assessment Audits. As part (or as a precursor) to your Content Strategy, our Content Audit will help uncover content opportunities that can be better leveraged for you to engage your target audience and build a relationship throughout their buying funnel. Why Does My Site Need a Content Audit? When it comes to Organic Search and SEO, Content is really the key to your success. While we have all heard that Content is King, it really is the entire Kingdom. Producing and promoting great content can help with audience engagement, can improve conversions, can build quality links to your website and can provide answers to the questions that your audience may be looking for. Depending on how well your site is performing in organic search, you will always need to adjust your content strategy. Content Marketing is something that is not new, but the manner in which we execute a content strategy in the digital age has meant that we have to be ready to produce content in a variety of forms for a variety of audiences in a variety of manners of consumption (mobile, tablet, desktop, apps, video etc). Ask yourself: Does the content on your website make you want to engage with your brand? Does your content make you want to purchase your product or service? Does your website content provide answers to questions that you may have about your brand? If the answer to any of these questions is “no” then you are probably in need of some sort of content assessment. A Content Audit can help educate you as to how well your existing content may be performing. Identify content opportunities that will assist in increasing the quality of the organic traffic to your website which will assist in better conversion of prospects into both online and offline sales. 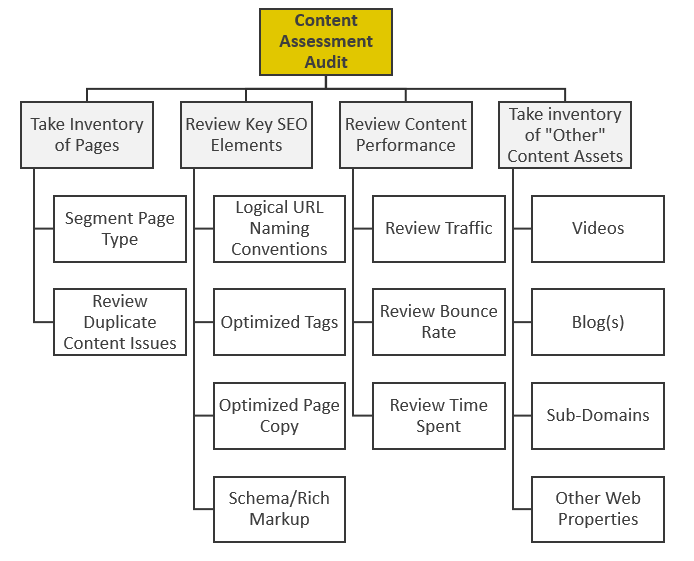 Recommendations from the Content Audit will then form the foundation of your Content Strategy and may be added to your SEO Roadmap that will outline and more importantly prioritize action items specific to content optimization and development with the intent to maximize visibility in organic search results. What Will I Receive as Part of a Content Assessment Audit? Gather of inventory of your page URLs – you need to know just how much content you have floating around out there on the Web. This URL inventory is limited to one domain. Inventory of additional domains can be added for an additional price. Conduct an assessment of your existing content reviewing your existing content assets and identifying additional content opportunities forming the foundation for your overall digital content strategy. Provide a Top Performing Page Report to identify your content that is driving the most qualified traffic and is the most engaged with on your website. We will look at key segments of your site to identify additional optimization and content opportunities. Identify content opportunities that will drive additional traffic and engagement on your website. Pricing for our Content Audits is based, in part, on the size of your website that will be reviewed. Supporting documents will be provided as required. Findings and observations from the Content Assessment Audit can assist in your content marketing efforts and provide a better understanding of the type, amount and frequency of content that you require to remain relevant in the digital space for your industry. If you would like a Content Assessment Audit, please contact us for a free quote.